Lieutenant Colonel Wilbert J. Thomas, Jr. was the Chief, Support Branch for the Air Education and Training Command Inspector General at the time of his retirement in July 2004. He was responsible for planning, organizing, and conducting Operational Readiness and Contracted Support Activity Inspections of Mission Support Group functions at 13 flying/training locations and 4 Air National Guard units within the Command. A native of New Orleans, LA, Colonel Thomas enlisted into the Air Force in June 1978. He was awarded the Honor Graduate Ribbon upon graduation from Basic Military Training in August of 1978. From there he attended the Administration technical school at Keesler AFB, MS, where he again graduated as an honor graduate. His first duty assignment was Offutt AFB, NE, while assigned there he was airman of the month and quarter numerous times and was promoted below the zone to SrA in 1980. In the summer of 1981, he was discharged from active duty and enrolled into the ROTC program at the University of Nebraska at Omaha. He was commissioned as a second lieutenant in May 1983. In October 1983, he was assigned to Nellis AFB, NV, as the Chief Customer Service. While assigned to Nellis AFB, he also had the opportunity to work as the Chief, Special Actions. In July 1986, he was reassigned to Zweibrucken AB Germany. While there he was once again the Chief, Special Actions and Chief, Personnel Utilization. In 1989 he was reassigned to the Air Force Military Personnel Center at Randolph AFB, TX. During this assignment, he was the Chief, Humanitarian and Exceptional Family Member Assignments and the Chief, Operations Support/Maintenance Assignments. In 1993 he became the Commander of the Military Personnel Flight at Tyndall AFB, FL. After completing the tour at Tyndall, he was selected for duty at Headquarters Air Education and Training Command as Chief, Promotions and Evaluations. Ten months after being reassigned, he was selected to attend Air Command and Staff College in residence. After graduation Lt Col Thomas remained on the faculty, where he held numerous positions in the succeeding 3 years to include: Deputy Chief, Command Studies Division, Squadron Operations Officer, and Chief, Plans and Programs. In May 2001 he was assigned as the Commander, 12th Mission Support Squadron, Randolph AFB, TX, until July 2003. Colonel Thomas retired from active duty on July 1, 2004. Colonel Thomas’ military decorations include the Meritorious Service Medal, Air Force Commendation Medal, Air Force Achievement Medal, Air Force Outstanding Unit Award, Air Force Organizational Excellence Award, Air Force Good Conduct Medal, National Defense Service Medal, Humanitarian Service Medal, Air Force Longevity Service Award, and United States Basic Military Training Honor Graduate Ribbon. Colonel Thomas is married to his high school sweetheart, Paula, and they have two children, Christine and Will. He enjoys a good movie, sporting events and photography. Young people putting service before self inspires him. After Hurricane Katrina he watched young people from all over the world clean up his hometown, New Orleans. 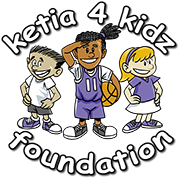 "The Ketia4Kidz Foundation has given me an opportunity to continue to serve others and more specifically it gives me an opportunity to inspire others to help young military children. The opportunity to help this foundation to reach military brats all over the world allows me to give back to a community that gave immeasurably to me and my family."